Jean & Jon Davidson Oeflein’s visit. Visitors Gallery – Send us your photos to be included here. For all of you that have already visited us, you’ll know how Mike likes nothing better than telling the story of ‘his’ build. It really has been a labour of love for Mike from start to finish. And it’s not over yet. So we thought it would be nice to give you all a ‘taster’ of the full story. This is Mike’s account of the project, in his own words. I was working freelance on a 3D CaD project for Angus Council when I first heard that the ‘old Davidson cottage’ was on the market. I already knew that the Davidsons hailed from Aberlemno due to the findings of a guy from Aberdeen who had done quite a bit of research some 5 or 6 years previously. I left the drawing office and drove to Netherton, parked across the road from the ‘Smiddy’ cottage and looked at the ivy cloaking the sad old building. Closer inspection showed evidence of fairly recent habitation despite the gaping hole in the roof. 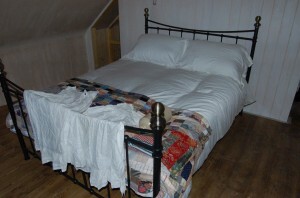 I could see an old bed shoved near to the kitchen range and the remains of a box bed which now housed a rudimentary pantry. A pushbike leant against the timber panelled wall under the remains of a steep wooden staircase which led to a narrow landing and in turn to low, combed doorways upstairs. 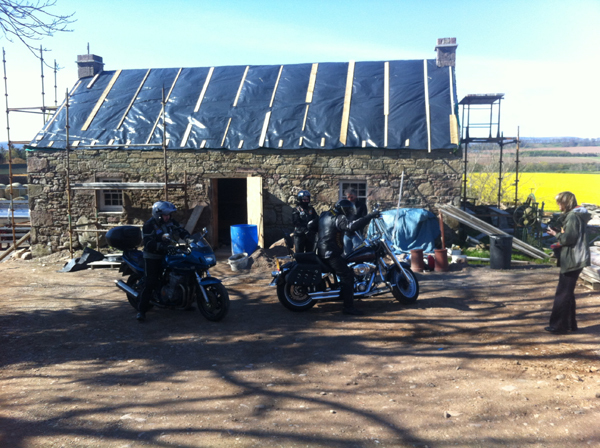 I think I had already decided that I must find out more about this place but first I had to visit the selling agent so I drove back to Forfar and approached the solicitor whose sign beckoned the next owner in the history of the cottage. I asked if there was a possibility of purchasing additional land along with the building as it was being sold as a plot with poor access. I was told to come back on Monday by which time the land owner would be able to answer. I left having stated an expression of interest. 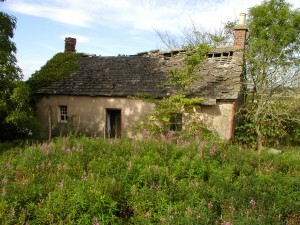 I returned on Monday only to be told by the solicitor that the property was sold and my noted interest meant nothing. Although I was suitably unimpressed by the action of this solicitor, I decided to try and find the current owner to see if he would accept a better offer, I contacted Maggie and we tracked down the owner after several miles and many phone calls. The owner told us that he had received an offer that had too many restrictions attached so I met him on site and made an unconditional offer that was 10k less than the asking price. The owner accepted then sacked his solicitor. During the time from first hearing about the cottage, we did our own searches to confirm the provenance and discovered that Angus Council had spent 3 years looking into this and had produced a small leaflet showing their findings. 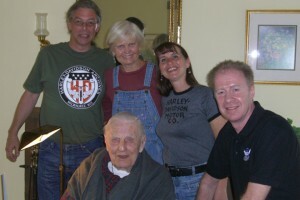 They had also tried to contact Harley–Davidson® directly and through the American Embassy to no avail. It may appear somewhat rash to purchase a building without first securing funds but I was sure that H. D. Enthusiasts would rally round and help secure this ‘world heritage’ site. I was wrong, as the people I thought would be interested, thought I was ‘daft’. 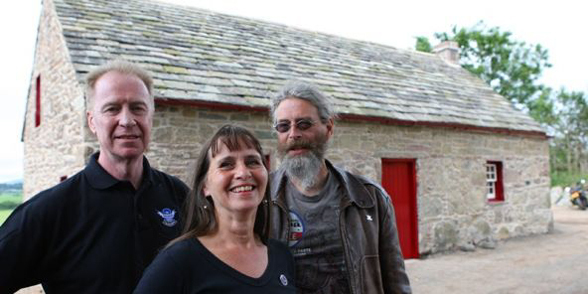 Keith, a long time friend who was keen on the adventure, decided to pitch in and we formed the “Netherton Cottage Development Company” and “The Davidson Legacy”. Research continued regarding the Davidson Family whilst I set up a pre-planning meeting with Angus Council’s planning department. I was told that, because it was an existing building and it was to be restored without change, we could go ahead without planning permission. The building was not listed but someone had proposed listing it due to the provenance. The next nine months were spent clearing the site and installing services to a caravan I had bought to use as a site hut. It turned out that the developer that had built new houses on the site of the adjoining blacksmith’s had got boundaries out of place so a lot of time was spent through solicitors sorting that out. The building was slowly and carefully cleared of roof materials that had caved in and the story emerged of Bella Edwards who was the previous occupier. Bella looked after her father until he died aged 96 in the cottage that had no electricity, water or toilet. Out of the blue, about 9 months after meeting with the planners, a letter arrived stating that full planning permission was required and that the build must stop. I answered letters about several concerns including power lines (not a planning issue) and the look of the cottage ‘fitting in’ with the countryside. Eventually I took the case to the Ombudsman who stated that , as I had no witnesses to my meeting, he would have to side with the planners. I drew up plans for the cottage fully restored to 1850’s spec with no water or toilet and received full residential consent. Due to the time wasted during this period, we got a lot of flak from many quarters and some even said we would not complete the project. We also had staunch supporters who saw us through the rough times. Milwaukee beckoned and, after meeting Jean Davidson and Arthur Harley Davidson, we returned with renewed enthusiasm for the build. 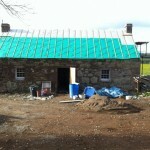 We applied for a grant to help with funding and, after a year of waiting, we could finally get on with the restoration. 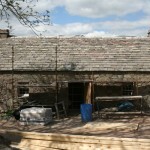 May 2011 was when work started in earnest. We had already stripped the cottage to 4 walls, saving what materials we could and logging materials and dimensions for everything else. No Building Warrant was needed because it was a ‘like for like’ restoration although I was not happy using low spec timber for the roof so C24 engineering grade was used in the same sectional sizes as original. The gable on the west side had to be demolished due to ivy growing through it (about 6” diam). A foundation was made and a 6” block wall was built to tie in the masonry outer wall. Wall heads had to be stripped to upper floor joist level in order to rebuild to the original design including vertical ties running from the joists to the rafters. This makes for a very strong roof which is tied down through the walls. Sarking was installed in order to further increase strength and avoid racking. 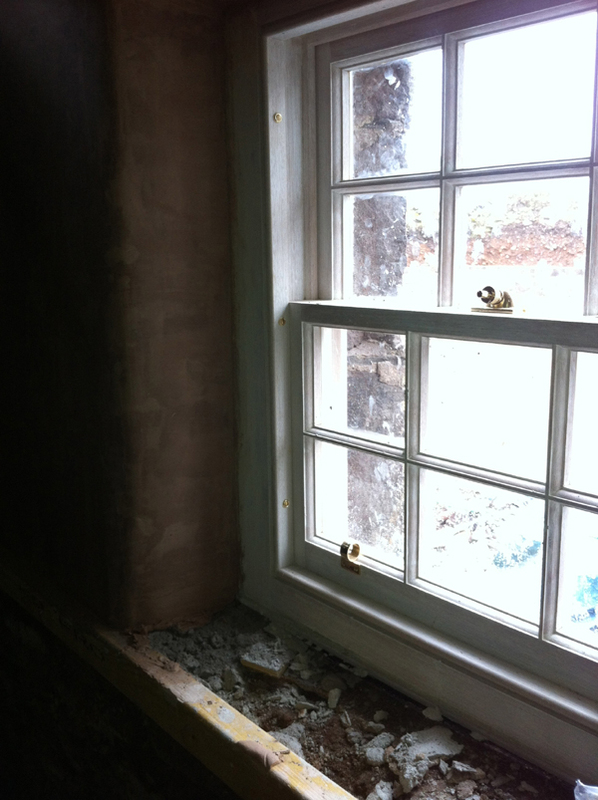 Traditional sash and case windows were installed following original design but made from hardwood to increase lifespan and provide a closer fit. Wall construction was of ‘bool and clay’ (field stones with a clay mortar) to top of lintels which was the original wall height in mid 1700s. 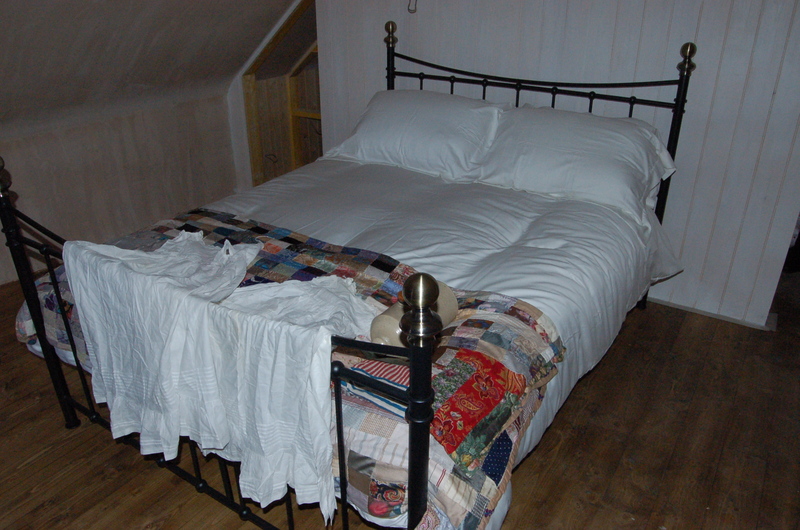 A further 2 feet was added in 1840s using Carmyllie stone and lime mortar in order to introduce attic rooms. 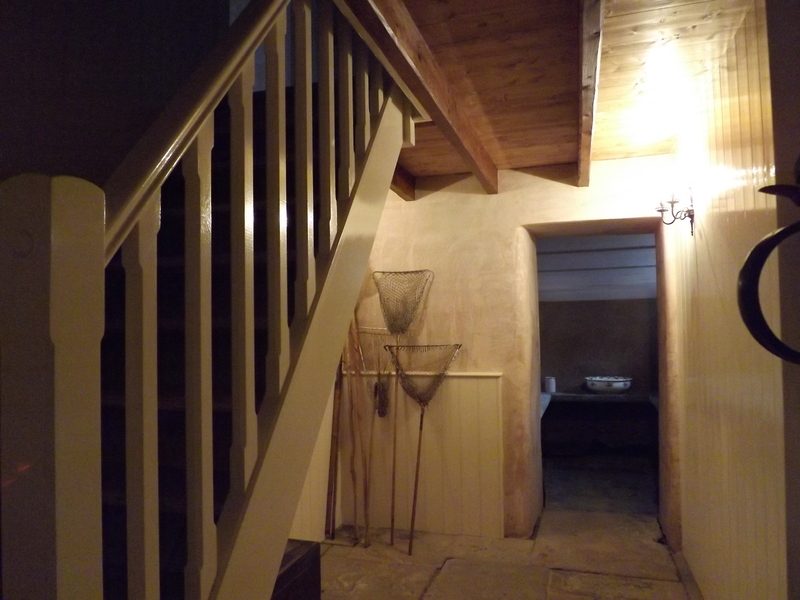 Interior masonry walls were finished with a lime plaster from wainscoat panelling to wallhead, lime plaster continues over combed ceilings in the upper floor. 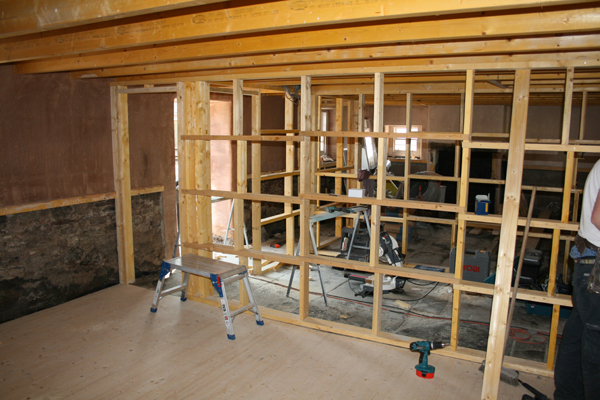 Cost considerations meant foregoing lath and plaster for plasterboard / plaster providing an acceptable finish upstairs. A concession to modernity was made by including 4” of glasswool insulation in the rafter space leaving a 65mm space for free flow of air to keep the roof timbers dry and ventilated. 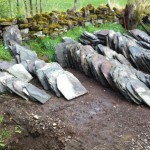 Sourcing Carmyllie stone slates for the roof proved difficult and I spent a week of evenings knocking on doors asking to buy slates from collapsed steadings. 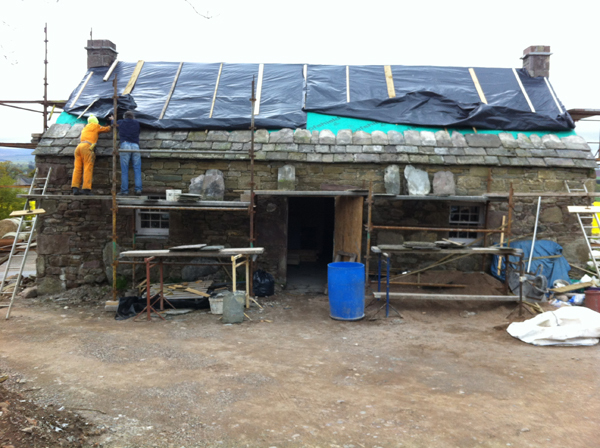 Not one person wished to part with the slates that will become rubble in a few years so I agreed to replace a whole roof with profile sheeting in order to get enough slates to finish the cottage roof. Dismantling a roof of these slates is a hazardous task and, whilst they pull off fairly easily, the wastage can be as much as 30 per cent as they split and crack. 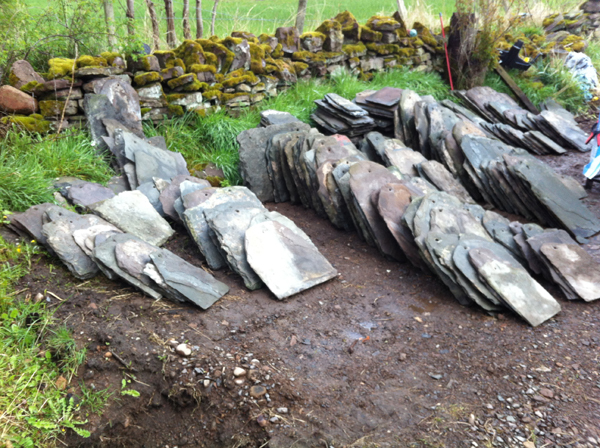 Dressing the good slates results in further losses to the extent that a roof of some 1500 slates can yield about 400 when fixed on the new roof. 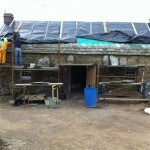 The slates were drilled after the old lime bedding mortar was removed then nailed onto the sarking with 3” clout nails. During the rebuild of the west gable, both chimneys were relined and the chimney heads were finished with a small ledge to the exterior to match similar local buildings of the same age. A picture of the cottage taken from the smiddy in 1905 shows the chimneys in this style. 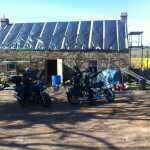 When we got the cottage the chimneys had been rebuilt in later Victorian style. 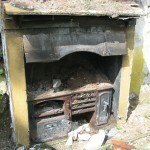 The fireplace in the parlour was missing but a local told us that it had been stolen. 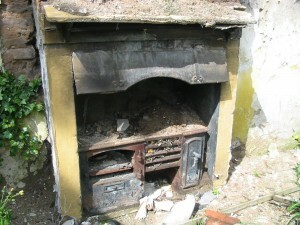 The fireplace had been a later Victorian tiled insert style. A hobgrate with thistle pattern cast in was installed to HETAS standards. 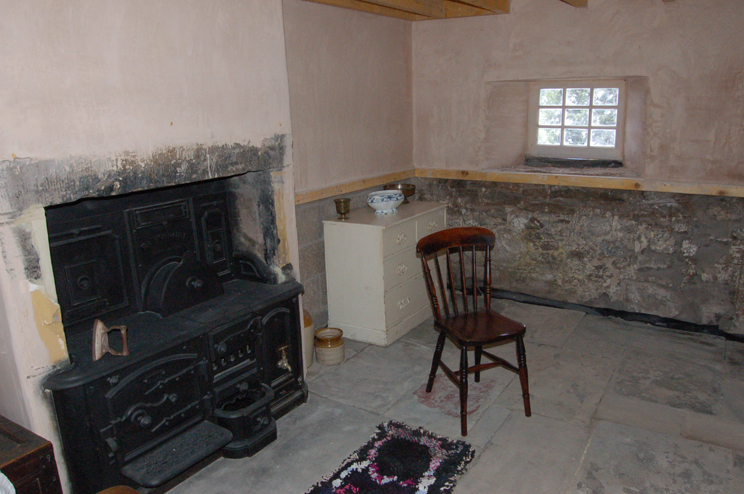 The kitchen range that was in the cottage was original and dated back to when the Davidsons lived there but was so badly corroded that a period replacement was found and installed. The original range was still being used as a room heater by Bella until she left the cottage. The replacement range is in almost new condition due to having been installed as a conversation piece in a farmhouse kitchen in Norwich. 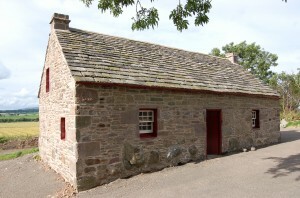 The range was cast in Falkirk and sold by a Dundee ironmonger. The original floorslabs were lifted and relaid having first removed the topsoil they sat on and introduced a membrane to halt ingress of dampness. 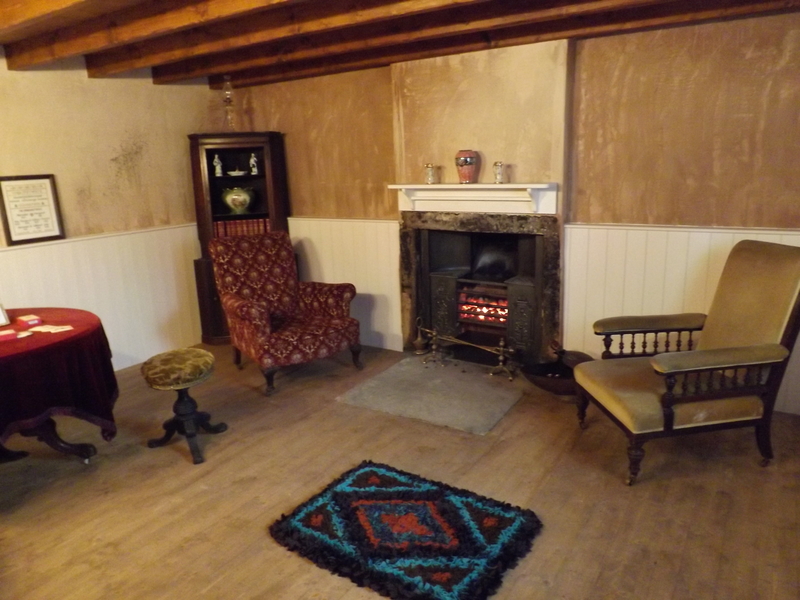 The parlour floor was found to have been constructed by laying round timbers, with the bark still on, directly on topsoil then nailing floorboards over. Due to the lack of height between the bottom edge of the exterior walls and the finished hearth level, it was decided to remove the topsoil, lay a membrane and pour a 4” layer of concrete onto which battens and floorboards were laid. 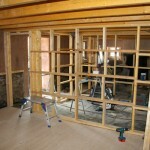 Interior framing for partition walls and wainscot panelling was in CLS . The upper floor was laid with 1 1/8” softwood planking that was carefully selected for stability. The timber arrived straight off the saw and had to be planed, thicknessed and machined for tongue and groove. A similar method was used to achieve an authentic finish on the panelling dividing rooms and forming the wainscot. Doors to all rooms are of ledge and brace style using panelling to outside of rooms. Hinges are ‘T’ type with thumb latches. 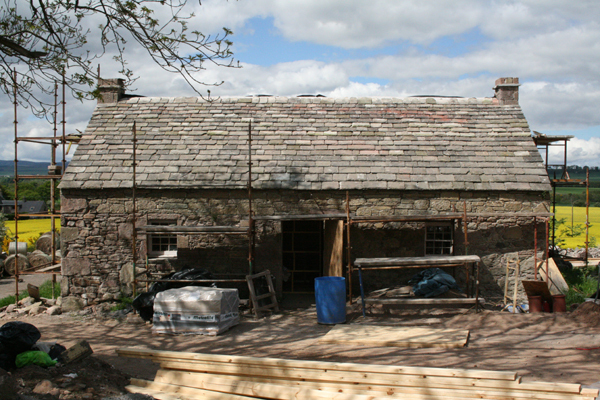 The coldroom/dairy on the north facing aspect had the slab floor removed and relaid. The original stone benches are in place for storing dairy produce and a wooden shelf will be replaced as original. The ceiling in the dairy was boarded and this will be reproduced. 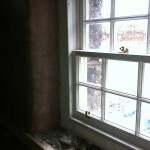 All Cills will be replaced with a simple bull nose detail with aprons where needed. Mantles will also be of simple construction, the kitchen range will have the original restored along with the existing smoke hood. Electrics have been installed (reluctantly) in order to provide lighting only, by way of candle sconces. Repro Victorian ‘jelly-mould’ switches are to be hidden behind panelling in recessed boxes to try to keep the intrusion to a minimum. 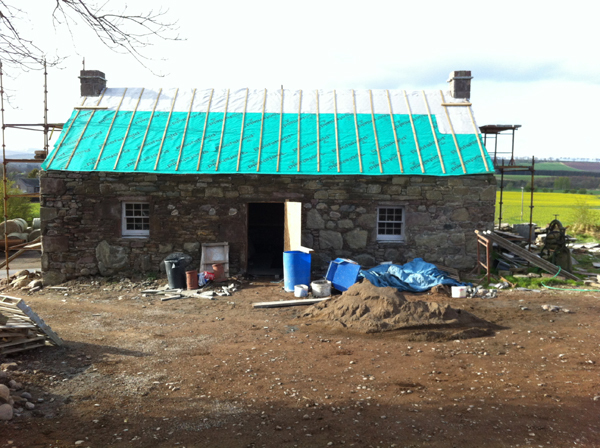 We have done our best within constraints of finance, knowledge and practicality to restore the cottage to a state whereby Sandy and Margaret Davidson would feel ‘at home’ should they return (some 155 years later). Decor will be decided based on period colours/materials and taking in mind social standing of the occupants. 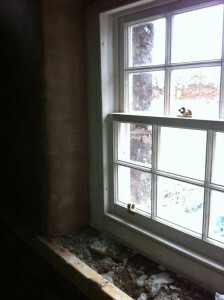 Window paintwork has been chosen to match the first colour found whilst peeling back about a dozen layers. Plasterwork in the kitchen had been finished with an ochre/yellow wash at the first layer and this will be replicated. Paintwork on panelling and doors will have to be our best guess for that period. Wallpaper will be used in the parlour and possibly the bedrooms. Ceiling beams will be ‘spoke shaved’ and painted a dark semi opaque brown. Rainwater guttering and downpipes were cast iron and some ¼ have been saved, the remainder having been scavenged from local buildings. 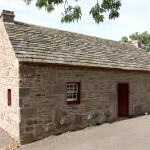 History shows that the cottage was built around the latter part of the 1700s and has changed little over the years apart from the aforementioned early roof height change. Bella Edwards, by living in the cottage much the way that the Davidsons had, has been responsible for protecting it from modern conversion and we thank her for that. The restoration will assure that a tangible Scottish link with Milwaukee will remain for generations to come.